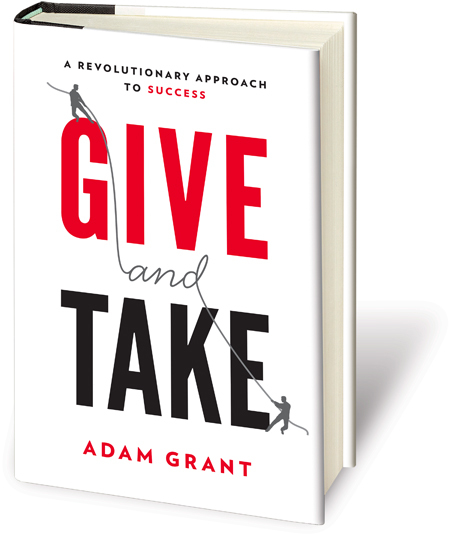 I am reading a terrific new book, Give and Take by Adam Grant. He is the youngest tenured professor at Wharton Business School and apparently full of great ideas. I recommend you check out his site and learn more about his new book and the man himself. Takers: Takers like to get more than they give. They put their own interests ahead of others and seek to come out ahead in every exchange. Givers: Givers want to help others independent of an easily foreseeable payback. They’re generous with time and expertise, and go out of their way to help others succeed. Here is the key question … which type generally is the most successful and which type is the least successful? On average, based on Grant’s research, givers are the least successful. The chumps so to speak. This is a broad stroke and people of each preference can be successful. Yet, what did the research say about which type is generally the most successful … the givers again. Givers can be chumps or they can be champs. Givers become champs by both taking action on own self-interests AND continuously helping others succeed. There need not be a balance and givers do not seek it. They help others succeed without expectation of an equal return. In the long run givers get back far more than they give. The book presents great research and true life stories of people representing the full spectrum of preferences. A start to Adam Grant’s book and ideas is in found in this article from Fast Company, Advice on Becoming a More Generous Leader. This article presents several ideas accessible to leaders here and now striving to be a better giver. Read the article for more detail, but really people you are not surprised, right? On Adam Grant’s website there is an assessment to give you some indication on the balance of your preference for taking, matching or giving. I took it and … 80% giver and 20% matcher. So the next question … am I a champ or a chump? The journey to me continues. Ha. I was hoping for 5 to 10% taker. Not to be. I got to be me. It is that fine Northern California living.